Plans are still underway to complete the structural engineering report on 192 Water St. so that the rebuilding process can start. 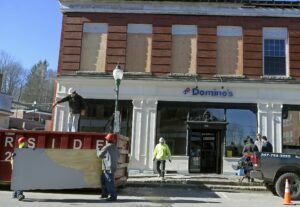 GARDINER — Nearly three months after a fire seriously damaged the historic building that housed Domino’s Pizza, work is continuing to return it to its former use. Building owner Fernando Stelser said Monday that a crew had started interior demolition work to clear out debris inside 192 Water St. If the work is complete by the end of the week, a structural engineer may be able to finish his evaluation next week. Once the structural engineering report is complete, Stelser said, he can finish his settlement with his insurance company. 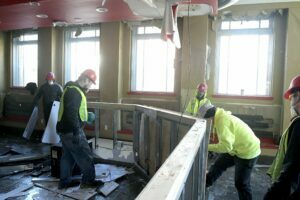 Once that’s done, he said, he can start the process of renovating the building so he can reopen his restaurant, as well as the offices on the building’s second floor and in its annex on Church Street. Stelser’s commitment to renovating the building is welcome news in Gardiner’s historic downtown. Geri Doyle, who serves on Gardiner’s Historic Preservation Commission, said reviving the building is important to the community. Nearly four years ago, another downtown fire at 235 Water St. destroyed one building and damaged four others, prompting several buildings to be evacuated and Water Street to be closed down for the duration of the fire. Eventually, 235 Water St. was torn down after it was deemed unsafe. The property was acquired by Claude Caron, the owner of Gerard’s Pizza, and converted into a dining patio. The three buildings to the west have since been purchased, and two have been renovated. Three days before the end of 2018, fire broke out in the former Maine Trust & Banking building. For 13 hours, firefighters from Gardiner and across the region worked to knock down the stubborn fire, which was burning in the spaces between the layers under the roof, which had been replaced a number of times. At the time, Gardiner Fire Chief Al Nelson said the second floor was a total loss. Even so, Stelser said he was committed to getting back up and running as soon as he could. The building had started as a two-story structure in the 1830s, according to an account of its history compiled by Katie Labbe and posted on Facebook on the day of the fire. In 1870, a third floor and mansard roof were added. A fire in 1901 destroyed the roof. The resulting smoke and water damage caused the building to be closed for two years. The building remained with four stories until the 1970s when the top two floors were removed. In 2017, Stelser and his wife and partner, Haldria Vale Jantorno, opened their Gardiner restaurant in the former Maine Trust & Banking building at the corner of Water and Church streets. 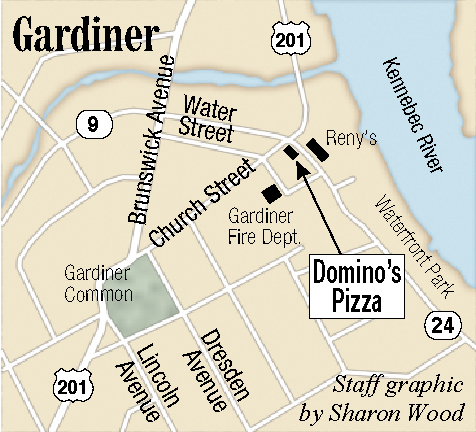 They already operated Domino’s in other communities, including Augusta and Auburn. The Gardiner location offered them something their other locations did not — a chance to offer seating for customers both in the main restaurant area and in the former bank vault and a small function area. 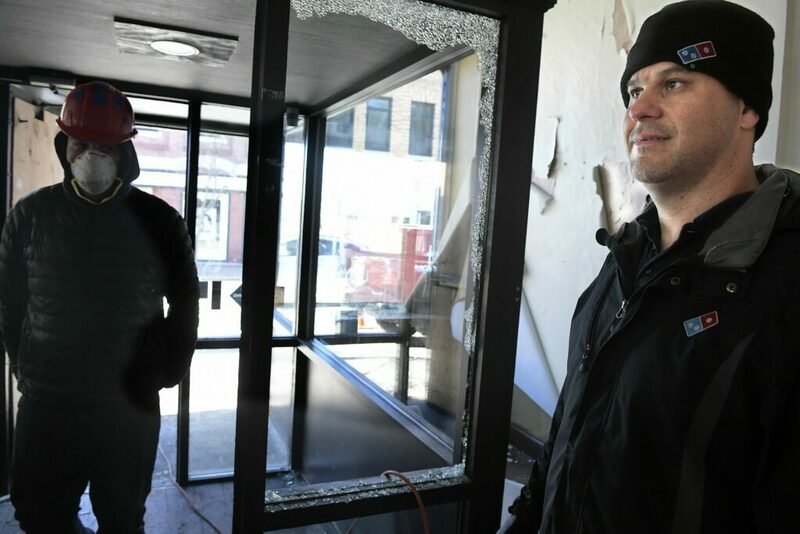 The building was also home to a variety of small businesses in the office space on the second floor and attached to the building’s Church Street side. In January, the engineer found the building would not have to be demolished. Now, he said, the engineer needs to take a look at the pillars to see what needs to be done to secure the new roof, he said. Stelser said he continues to work toward opening the restaurant again, as well as the offices.